"I want to thank you for your expertise in rigging, seamanship, and navigation that allowed us to conduct our seminal test that proved that fresh water wells can be placed in the sea.
" Your cordial manner, enthusiasm and can-do spirit made this test a pleasure for me and my crew. You were part of proving the SeaWell concept.
" I hope we can all look back on February 9th, 2008 as the day we started solving the world's water shortage." --- Michael Schieberl, President, SeaWell Global, Inc. 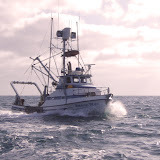 Copyright 2019 Monterey Canyon Research Vessels, Inc.